Immerse yourself in splendid isolation in the most unspoiled reaches of the Samet Island. There are no other resorts, just the whisper of the waves and sea breeze to break the silence. Only a scenic 45-minute departure from Baan Phe Pier, with spectacular views of the Samet island, brings you to Samet Ville Resort. Offering 44 bungalows, this is the only resort on an island whose 11 acres include two of Samet's finest beaches, boat easily accessible to guests. 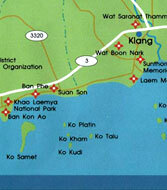 Please meet us at Baan Phe Office (Koh Kaew Resort) before leaving to the Island. The parking lot free of charged. For guests who travel by public transport, should take Bangkok-Ban Phe Bus directly. Air-conditioned coach leaving Bangkok from Ekkamai Bus Terminal, Sukhumvit Road every hour starting from 5:00 a.m. onwards until 20:30 p.m. It takes from 3.5-4.5 hours each way. 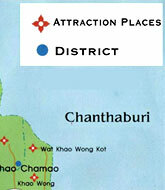 The Ekkamai bus station information number is +66 (0)2.391.2804. 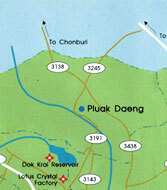 Minibuses leave from Khao San Road daily and go directly to Baan Phe. Facing to the pier, turn left approx. 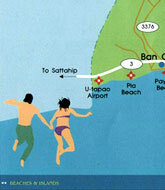 250 Meters, Koh Kaew Resort will be on your left. Located 250 meters from the bus station, or 350 meters from the Baan Phe Police Staion, heading for SaunSon, Phe Aboretum (facing to the ocean and turn left) Guests MUST visit us at Koh Kaew Resort before leave to the Samet Island. Transports go from Koh Kaew Resort to the dock. Pra-Ar Pai, passenger boats leave everyday during high season. During low season, or if you miss our boat, we will help you for transfer at the cheapest cost. 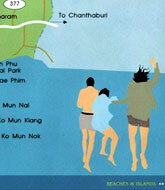 Ferry Fare is 200 Baht/round-trip. The trip is approximately 50 minutes. 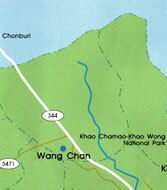 If you are on the island, Ao Wai is on the Southeastern of Samet Island. Taxi hire to Samet Ville Resort to is 450 Baht. 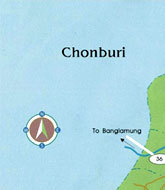 *Ferry Schedule maybe subjected to change without prior notice. Please call +66.38.651.681-2 or e-mail to questions@sametvilleresort.com for the update ferry time and. Reserve the seat in advance is required.